Artists are always stretched by a tension between past and future, known and unknown. When an artist’s work meets acceptance, the temptation is to capitalize on that form, to repeat and stay with what is safe. Aging rockers become tribute bands to their own glory days. And in the classical music world, we tend to view Mozart, Beethoven, Brahms and Bach as fixed constellations in an unchanging heaven. No one dreams of improving the night sky, nor of exhausting the wonder it arouses. But, as contemporary astronomy reveals, there is nothing fixed about the stars; celestial objects are not only diverging and receding, but accelerating in that expansion. It’s trite to say, of course, but even the music of J.S. Bach was once new. And with this audacious program, Camerata Pacifica’s Artistic Director Adrian Spence seemed intent on storming the museum and freeing Bach from the glass case where he’s been suffocating. Not only was Bach’s music juxtaposed to modern compositions, but instrumentation ranged from harpsichord to clay flower pots, and even finished with live electronic looping. The concert began gently and accessibly with harpsichordist Paolo Bordignon playing 2 Part Invention in F Major, a short lead-in really to Bach’s Trio Sonata in G Major, which added flute (Spence), oboe (James Austin Smith), and cello (Ani Aznavoorian). The Canadian-born Bordignon, whose far-ranging career includes principal harpsichordist with the New York Philharmonic, is one of the world’s experts on the instrument. He has graced the Camerata stage before, memorably at the Brandenburg Concerti climax of the 2014-15 season. For the Sonata Aznavoorian played from an upraised platform, that amplified the cello’s sound while doubling the basso continuo line. Woodwinds paired and sparred like twirled DNA strands above the steady stepping of cello and keyboard. But this was all prelude to the night’s heavy-hitter, Elliott Carter’s Sonata for Flute, Oboe, Cello & Harpsichord (1952). Spence reported from stage that Carter always insisted his music was very simple. “It is simple,” Spence quipped, “there just happens to be lots of simple.” He advised the listener to step back from the music a few paces for perspective, and even permit the attention to wander. I took that suggestion to heart, attending to the phrases and contours rather than the notes, and verified indeed that Carter has a point. Still, it is easy for the diatonically-minded to be unsettled by broader tonalities; a surprising dunk in cold water, which assaults while it invigorates. 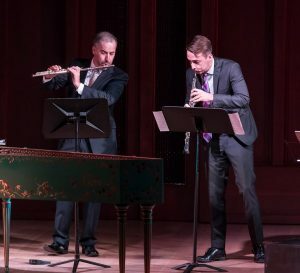 From the musicians’ side, the Sonata is a demanding work that frequently places the harpsichord in dialogue with the ensemble, which then answers in tightly arranged outbursts. If the sound of harpsichord instinctively calls up baroque associations for you, this work goes miles in updating that mental file. Then percussionist Ji Hye Jung and bassist Timothy Eckert joined Smith and Bordignon for Les Citations for Oboe Harpsichord Double Bass & Percussion by Henri Dutilleux, which “cites” or quotes composers Benjamin Britten, Clément Janequin and Jehan Alain. The work began with a beguiling plaint on Smith’s oboe, but soon textures thickened and tensions ratcheted. One compelling section featured solos by Eckert and Jung, and moved with the loose logic of free-form jazz. The first half concluded—in obvious features at least—as it had begun: Bach for solo harpsichord. But after the Carter and Dutilleux, the ears were ready for a very different face than the one communicated in the Trio Sonata. Bordignon handsomely tackled the wild Chromatic Fantasy & Fugue in D Minor with all its roving key centers and irresolution. Spence’s programming intention seemed clear: it’s not a question of how radical was Bach, but how radical is Bach! And, of course, there was the rare pleasure of hearing the work articulated on harpsichord rather than piano. This might ordinarily have felt like a ritual concession to “authenticity”; but after the Carter and Dutilleux it simply became the right color and texture for the piece. The second half of the program featured Jung in three duets by young composers. But first the percussionist wowed the audience with her solo marimba arrangement of the Fuga from Bach’s Violin Sonata No.1 in G minor—the most stunning translation of Bach to my ear since Edgar Meyer modified the cello suites for double bass. Aznavoorian then joined Jung for Caroline Shaw’s whimsical Boris Kerner for Cello & Flower Pots. Shaw, who is the youngest composer ever to win the Pulitzer Prize, is impressively conversant with styles and daringly open to unconventional sounds. Jung knelt on a mat before 9 clay flower pots which she played with drum sticks. The introduction was a quarter note walk on the cello through scaler figures and intervals that resembled a dance from a Bach sonata, before the pots burst out in with rapid-fire rolls. The aural colors of ceramic flower pots are unlike anything found in the conventional percussion arsenal, some bordering on wood blocks, others as delicate as glass bells. Spence joined Jung for the most lyrical and soft moment of the night, Japanese composer Naoko Hishinuma’s duet for flute and percussion, On a Full Moon Night. Finally, the program concluded with the very unusual upbeat work, 21 for Marimba and Cello by Caribbean steel drum virtuoso and composer, Andy Akiho. Not only did Aznavoorian and Jung master the impossible polyrhythms, but they made it look like fun. The opening measures were digitally recorded, and then looped back at several points for extra texture. 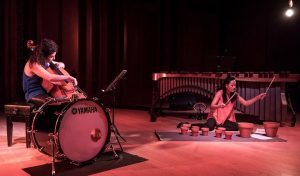 Amping-up the concept of multi-tasking, Aznavoorian played the foot-pedal bass drum and cello simultaneously, while Jung added to her marimba a foot-controlled tambourine and the electronic loop petal. The result was a sense of four or six distinct musicians on stage. And to top all, Bach stitched together this second half as well: Akiho’s 21 was inspired by the sequence of harmonies in the 21st measure of the Fuga that began the set. We can thank Camerata Pacifica for a very unusual night of cutting edge music, old and new; one that certainly would have pleased a progressive artist like Bach. This entry was posted in Essays, Music, Reviews and tagged Adrian Spence, Andy Akiho, Ani Aznavoorian, Camerata Pacifica, Caroline Shaw, Elliot Carter, Henri Dutilleux, James Austin Smith, Naoko Hishinuma, Paolo Bordignon, Timothy Eckert on December 3, 2016 by joemiller.